Zhimin Yu (ruan soloist-composer) was born in Beijing, China. While studying as a student, she was chosen to perform for foreign states’ guests and leaders. Zhimin Yu joined the top orchestra of China at the age of 17 (CCTV Broadcasting Symphony Orchestra). She has given many performances around the world, including live concerts for BBC (London), NHK (Japan), CCTV (China), and CBC. 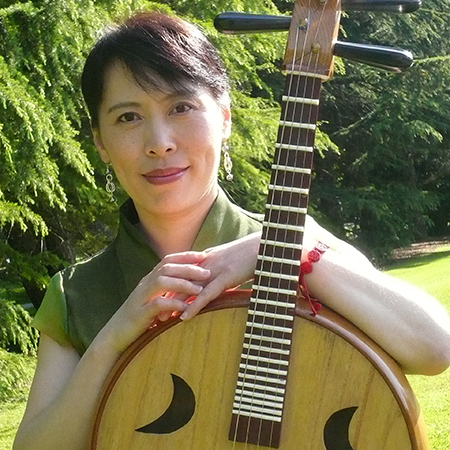 Zhimin has played for many famous people, including the Dalai Lama and the Emperor of Japan. She has worked with many symphonies and groups, including Vancouver Symphony Orchestra and Calgary Symphony Orchestra. Ms. Yu has done concert tours in major cities in Canada, the United States, Britain, France, Holland, Hawaii, Indonesia, Philippines, Malaysia, Japan and Hong Kong. She has also composed many pieces that have been broadcast and has appeared on many CDs. She has taught at UBC Asian Center and Beijing Children’s Palace Station.